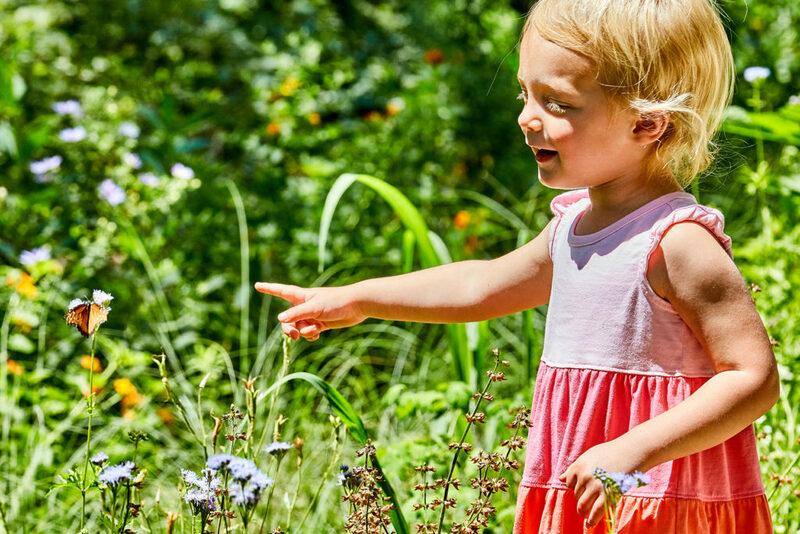 The conservation park gives natural beauty and habitats a chance to thrive. 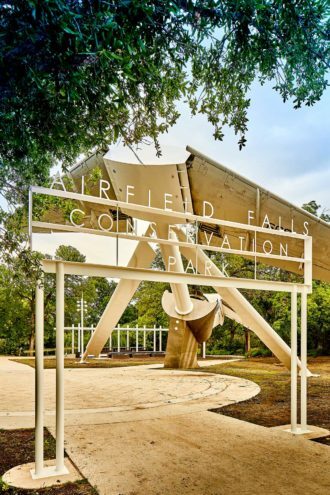 Had it not been for a personal invitation from landscape architect Kevin Sloan, I probably would have never found Airfield Falls Conservation Park, a new park about 40 minutes from downtown Dallas, in northwestern Fort Worth. More a neighborhood park than a regional attraction, Airfield Falls sits about 600 feet south of the Naval Air Station Joint Reserve Base and adjoining Lockheed Martin plant. To find it, I had to wind through a cluster of subdivisions, the kind of low-slung, nondescript ranch houses that are everywhere in North Texas. By the time we arrived, my three children had fallen asleep in the back seat, wrappers of half-eaten Sonic hamburgers on their laps. I lured the kids on this expedition with the promise of a waterfall. 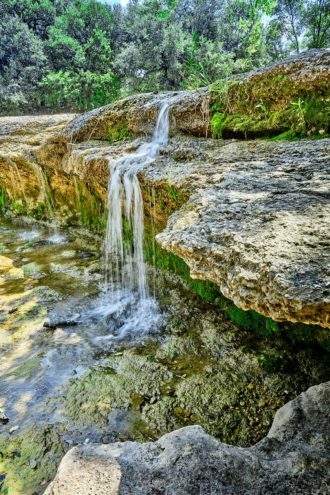 Airfield Falls does boast what is called Fort Worth’s “tallest natural waterfall,” though the feature is hardly Niagara. Over the course of a few million years, water from a shallow tributary of the Trinity River has eaten away the thin layers of stratified sedimentary rock that sit beneath the soil of much of the region, forming what looks like a series of craggy limestone steps. Perhaps the most spectacular thing about Airfield Falls’ waterfall is that it is still there. North Texas was once covered with these kinds of delightfully understated natural features—springs, creek beds, natural pools and ponds, tiny waterfalls. Most have been paved over. Airfield Falls’ modesty, says Sloan, who designed the park, is part of its appeal. He sees the park as an example of what he has dubbed the Dallas-Fort Worth Branch Waters Network. It is a concept for rethinking North Texas’ relationship to its river by embracing the many spindly tributaries and greenbelts that wind their way through the urban environment, to use these natural features as a strategy to reorient, guide, and enhance the city. Airfield Falls, Sloan says, is an example of something Dallas could do, abstract concept made concrete. 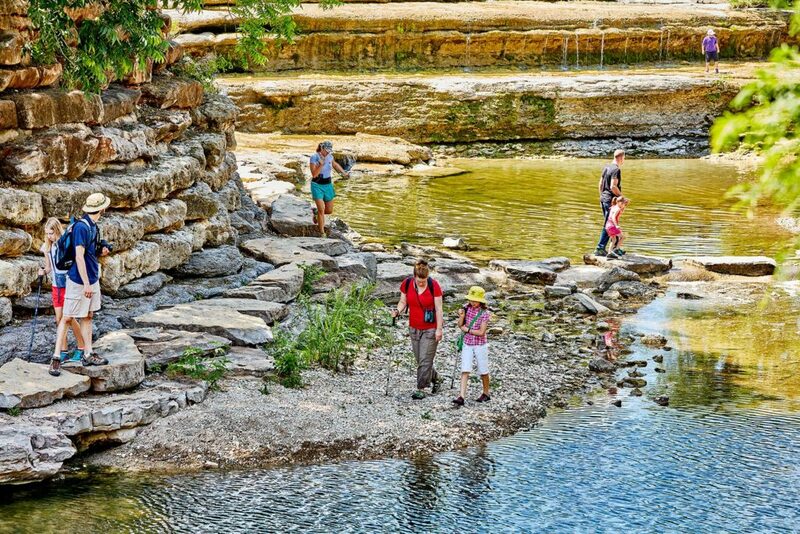 While Dallas has spent decades bickering about how to turn its stretch of the Trinity River into a “world-class” park, Fort Worth has quietly built a network of trails and interconnected parks through its 88 miles of river branches, greenbelts, and tributaries. Airfield Falls is the latest piece of that larger puzzle, a trailhead with a picnic pavilion, a butterfly garden, and access to the creek and waterfall. It was developed on a slim budget of about $1.6 million by the Tarrant Regional Water District, which has been responsible for much of Fort Worth’s Trinity River Vision park plan. Tim Love’s Woodshed Smokehouse is nestled up against the Clear Fork of the Trinity River, just south of downtown Fort Worth, and is easily accessible by the Trinity bike path system. 3201 Riverfront Dr., Fort Worth. 817-877-4545. Fort Worth’s Trinity Trails system includes 40 miles of trails along the river and its tributaries, and connects 21 parks, as well as the Fort Worth Botanic Garden, Zoo, Stockyards, and downtown. trinitytrails.org. You can’t miss the massive airplane wings. The pieces of the McDonnell Douglas C-9 jet nod to the park’s history and proximity to Lockheed Martin and the naval base, while making the turnoff to Airfield Falls easy to find. They are also something of a misdirect. Unlike the towering, expressive airplane sculpture, most of what is happening in the park is very subtle. The small car park is engineered to capture rainfall and direct it into a pond. The landscaping is drought-resistant. The picnic pavilion is built on the foundation of the old base commander’s quarters. After we jumped out of the car, I let my drowsy kids navigate their way through the park. We followed a bend in a path that stopped at some rocks along a forested creek bed. The kids climbed onto a shallow sand bank and spotted small fish in the clear waters. We backtracked to a bridge that led us farther into the woods, where we found the butterfly garden teeming with spring migrants. Approaching the waterfall from upstream, you hear it before you can see it. A grassy meadow gives way to a wide gouge in the landscape cut by the trickling waters of Farmers Branch Creek. The creek flows down a stratified series of limestone ledges where shallow pools form and populate with algae and tadpoles. The kids rolled up their pants to their knees and waded in, making their way along a steep embankment to the deeper waters of the creek below, where they skipped tiny stones across the cool water. I propped myself up on a lip in the limestone cliff and let them play. A pair of bikers whisked past on the way to the trails. A couple and their toddler carefully climbed down the edge of the falls to explore the pools. A middle-aged couple paused their walk to stand in the shade of a tall pecan and admire the water and the children. SMALL WONDER: Airfield Falls contains Fort Worth’s tallest natural waterfall, which doesn’t exactly make it big. But it is rare: most of North Texas’ water-based natural features have been paved over. And like the rest of the park, which includes a butterfly garden, it has a subtle beauty. Watching these small moments unfold, I realized that what makes Airfield Falls special is that it isn’t meant to be experienced as an event or a destination. It isn’t a park tasked with the work of forging civic identity or satiating outsize ambition. Rather, the design is a considered reaction to simple elements that were already there: a curious history, a subtle ecology, a remnant of a relatively untouched natural landscape. As a result, because of its scale and simplicity, Airfield Falls allows for those who live near the park to experience the natural beauty of this corner of Texas as part of the habit of their daily lives. I couldn’t help but think that because of its scale and simplicity, there could be Airfield Falls all over Dallas, too. My middle child tired of the stone skipping, and I struggled to lure the other two out of the water. They made me promise to take them back but with bathing suits and towels next time. I promised. There is no Barton Springs in Dallas, and only a few decent swimming holes or lakes within an easy drive of the city center. I can see this little spot becoming a part of my family’s summer routine, a beautiful way to splash away a hot July afternoon.